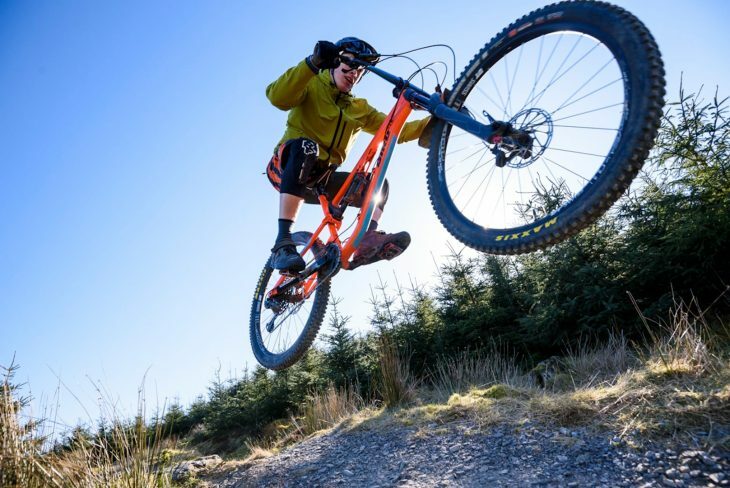 With more and more brands selling complete mountain bikes direct to consumer, we decided to check out three of the latest options from Intense, Bird, and Sonder, to put each brand’s service – and bikes – to the test. Over to James Vincent for the review! Based near Swinley Forest [co-incidentally this issue’s Classic Ride – Ed] on the outskirts of the M25, Bird Cycleworks is run by a couple of long-time riders and racers, Ben Pinnick and Dan Hodge. Bird has only been around since 2013, making the company itself a relative newcomer to the industry. Bird Cycleworks brings a decidedly UK-centric design approach with the Aeris 145. Brimming with youthful enthusiasm, Pinnick and Hodge haven’t exactly been twiddling their thumbs over the past five years. 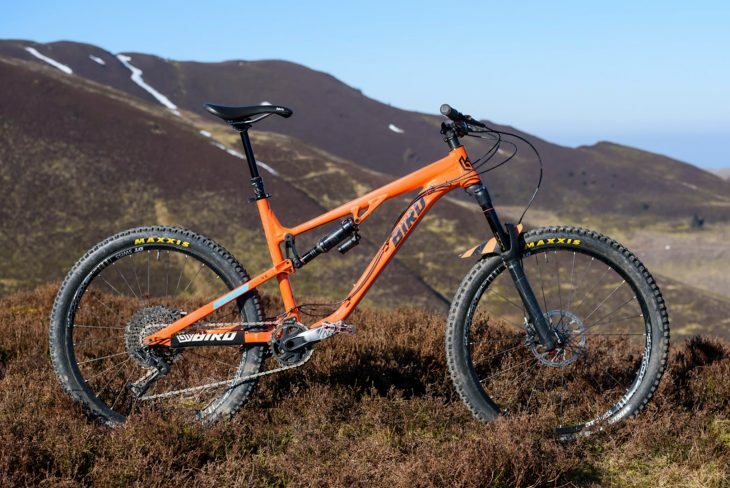 The current line-up boasts a 130mm-forked hardtail (Zero TR), a 150mm-forked hardtail (Zero AM), a 120mm travel trail bike (Aeris 120), a 145mm travel all mountain bike (Aeris 145), and a big 150mm travel 29er enduro bike (Aeris AM9). The bike we’ve got here is the Goldilocks option, and is the second generation of Bird’s most popular full suspension model: the Aeris 145. All bikes are designed by Pinnick and Hodge, and manufactured in Taiwan. 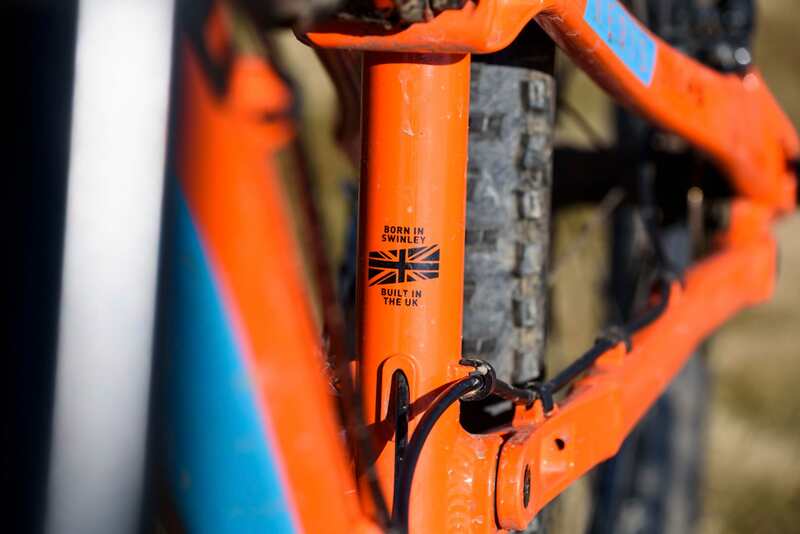 The frames are shipped to the UK, before being assembled into complete bikes and sold through a website with an options list long enough to put most car manufacturers to shame. All complete bikes are assembled in the UK from the tyres up. Starting with one of four base builds, you can customise everything from tyres to dropper posts, bars to brakes. 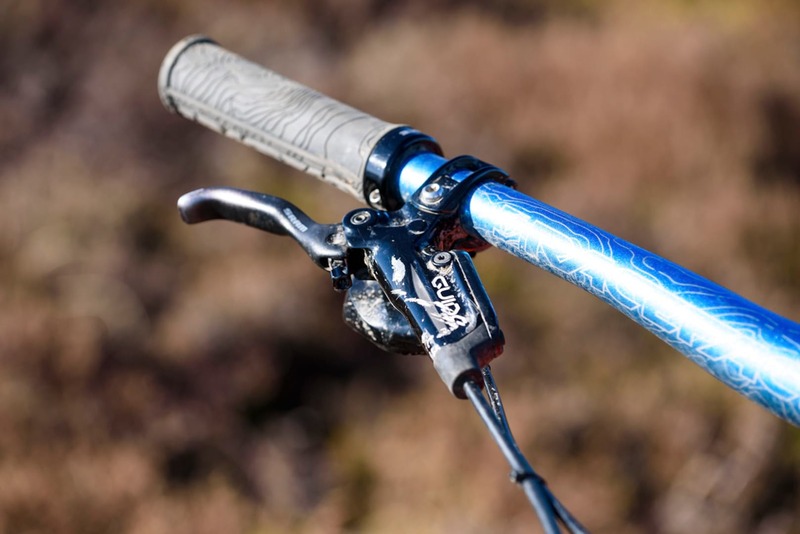 You can even place a special order and get parts that aren’t listed on the site, meaning you could be riding your ultimate set-up without having to swap any bits out yourself. Impressive stuff. From day one, the team at Bird has made themselves readily available to customers, either at the end of a telephone, through an extensive (and regularly updated) FAQ section on the website, or via Bird’s southern head office and various demo days across the country. In addition, Bird has recently introduced a northern base for demos, as well as a small demo fleet available at Cwmcarn in South Wales. 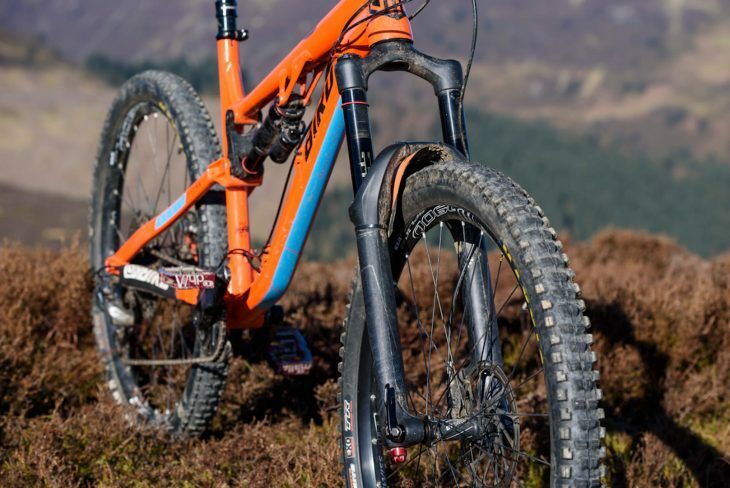 The Aeris 145 is an enduro-capable 27.5in full susser. Building on the success of the original Aeris 140, the name is the only thing that remains unchanged on this new model. 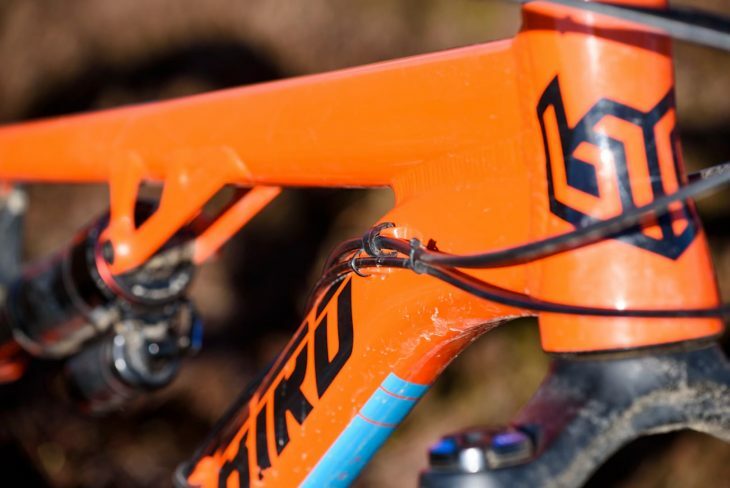 The frame sports new geometry and suspension kinematics and although it’s still crafted from aluminium, the grade is improved and the tubing refined. There’s an industrial aesthetic to the frame, with large CNC machined chunks of alloy used for the dropouts, the shock linkage, and a one-piece structure that houses both the bottom bracket and main pivot. 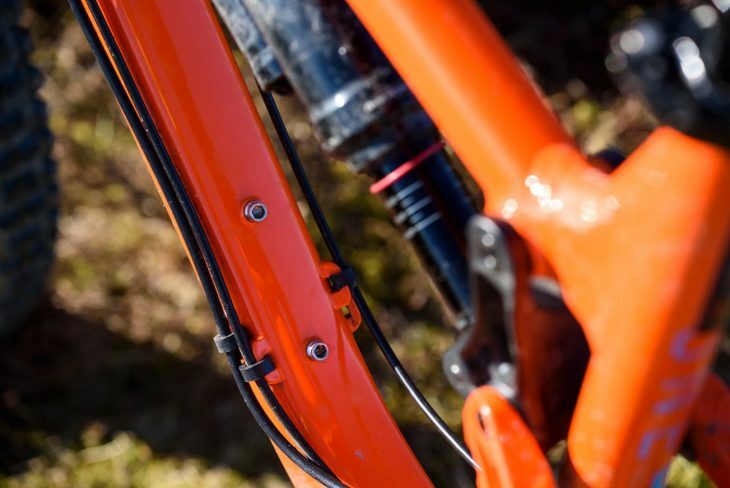 The Aeris 145 is also now 1x specific, allowing pivot points to be widened and bearings made larger to alleviate the flex of the previous model. Thanks to the Boost rear end, there’s now clearance for 2.6in tyres even with short (435mm) chainstays. Super robust alloy frame with chunky CNC machined junctions. Battleship dropouts with direct-mount brakes. Small but appreciated details on the Aeris 145 frame include full-length external cable routing (except for the last section for the stealth dropper), bottle cage bosses inside the main frame, a threaded BB shell, and the option to run a full chain guide via ISCG 05 tabs. The Aeris 145 will accommodate a 150–170mm travel fork, though the stock build features a 160mm Yari RC and a 65.1° head angle. While rear travel is fixed at 145mm, Bird has just released a new LT (long travel) version of this same frame with 160mm rear travel. The extra travel is unlocked via a new linkage, which also slackens the head angle to 64.6° and drops the bottom bracket a touch. What’s nice is that existing Aeris 145 owners can buy the new linkage separately. There’s scope to fit a 150-170mm travel fork. An aftermarket LT linkage pumps up rear travel to 160mm. There are four base builds for the Aeris 145 that centre around the drivetrain spec. Simply choose a SRAM NX 1×11, Shimano SLX 1×11, SRAM GX Eagle 1×12, or SRAM XX1 Eagle 1×12 groupset, and then customise from there. With a blank page for our GX Eagle 1×12 test bike, I did my best to rein in my inner child and keep things realistic, though I did spec a piggyback shock to provide better damping on the rougher terrain we get up here in the Lakes. The metric RockShox Super Deluxe RT3 runs on cartridge bearings at each end for extra sensitivity, and is a superb performer. Full external cable routing and water bottle mounts. Arriving already set up tubeless (nice touch!) the DT Swiss wheelset and Maxxis tyre set-up is a winning combo. In particular, the ‘Wide Trail’ Minion DHR II has become my new favourite front tyre for all but the sloppiest of conditions. Likewise, the full SRAM GX Eagle groupset offers generally superb performance. The only negative is that it’s sensitive to set up. 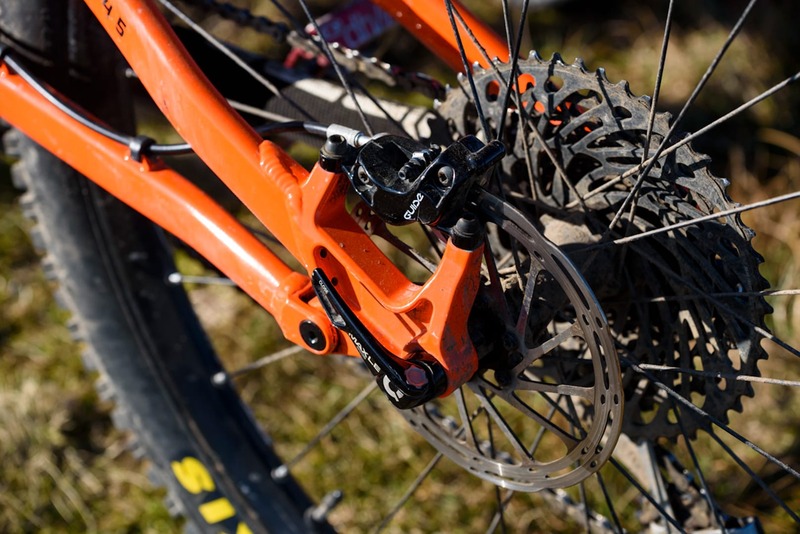 During testing I caught the rear mech and knocked the hanger slightly out of true, which in turn caused the gears to jump about a little – more so than I’ve experienced with SRAM’s bulletproof 11-speed drivetrains. As it was, we ended up with a snapped chain while on the photo shoot. The Guide R brakes worked great initially, even if the stock SRAM pads don’t last very long, and as they wore down and the lever throw increased, I missed the adjustable bite point found on the higher end Guide RSCs. Once the pads wear, the Guide R lever feel suffers. My first test of the bike’s abilities came while visiting friends for a ride around the Surrey Hills. 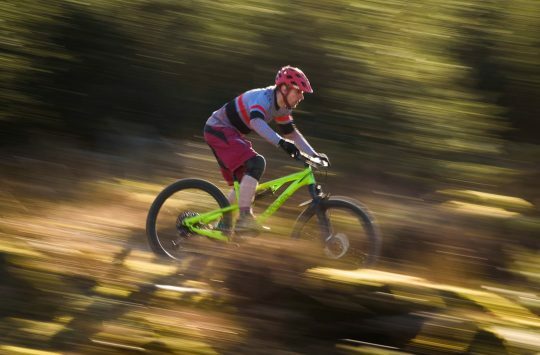 On completely alien terrain to me (and on a brand new bike), the Aeris quickly felt at home on the sculpted twists and turns of Surrey. Pushing my weight further forward to load up the front end, we hit a short rocky and rutted section. And this sums the Bird up for me. The Aeris is most at home when off the brakes and charging. It is not a bike to tackle things slowly or delicately. This bike wants to be unleashed, to tackle things you otherwise wouldn’t dream of. And with its humungous wheelbase (1,255mm) and slack head angle, it gives you all the confidence you could possibly need once you’ve got your head around its dimensions. Talking of dimensions, this bike is long. Like, artic lorry-long. The L size comes with a massive 506mm reach measurement, which is bigger than most brands’ XL size. According to Bird’s online size calculator, at just a shade over 6ft tall I should be on the Large, though I reckon I could easily fit the 481mm reach of the M/L size. My advice? Either make sure you’re VERY confident in your numbers, or get yourself a demo ride before committing to a particular size. The huge front centre takes some getting used to. Also of note is the 120mm head tube on the L size, which is, vertically, about 25mm shorter than my usual ride. Combined with the extra long top tube, I initially had far too much weight on my hands, which made me feel like I was going to tip over the bars. I raised the stem by 20mm and the bike was transformed. Little adjustments, big changes. 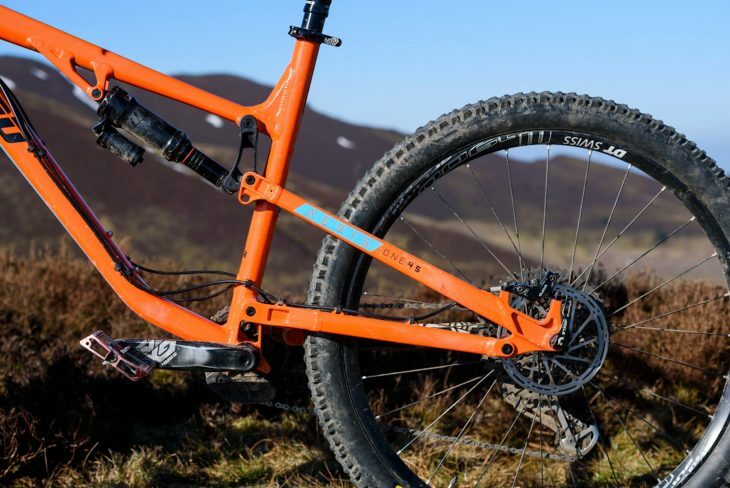 Despite its length and smooth suspension, pedalling the Aeris doesn’t feel as ungainly as you might expect. In fact, with the steep 75.6° seat tube and saddle slammed as far forward as it’ll go, the bike feels pretty efficient for a 14.4kg 145mm travel machine. With your weight centred nicely between the wheels, the Aeris 145 climbs up fire roads at a steady pace and with minimal pedal bob. Being such a long bike, some manhandling is required through tight corners. 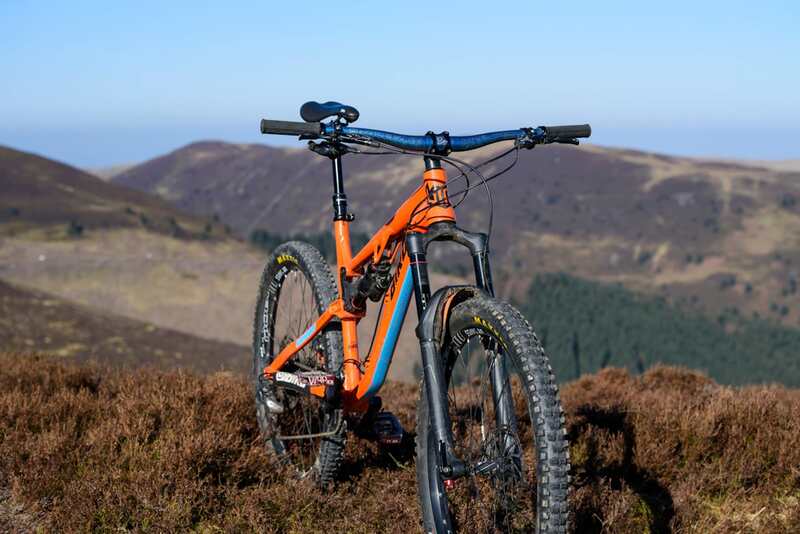 But though the Aeris puts you in a great position for steeper climbs, at times the front and rear of the bike do feel like they’re at opposite ends of a grand dining table, with a distinct lack of communication between the two. 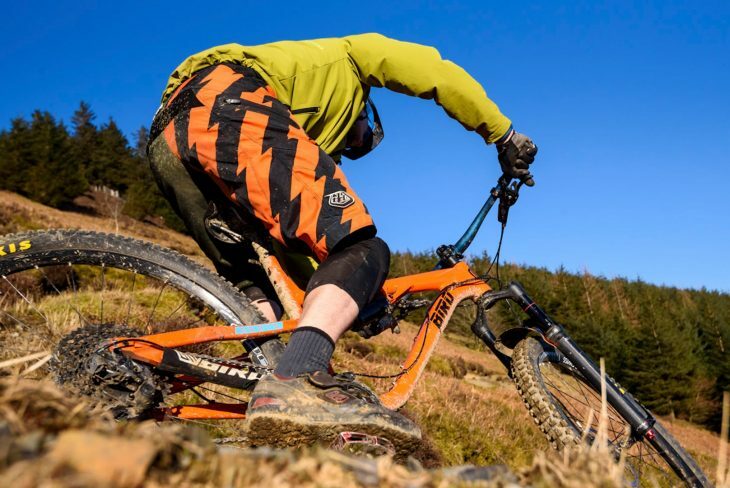 The knock-on effect is that it doesn’t really excel at technical trails either up or down – you know, those ones where you really need to manhandle the bike to pick the right line. This bike doesn’t dance with finesse, especially at lower speeds. Sure it’ll get round the tight stuff, but you’ll need to really exaggerate your movements to make it happen. 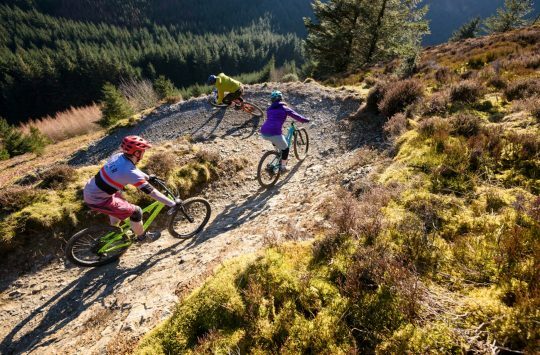 If you’re the sort of rider who gets as much satisfaction from clearing a tricky climb as you do from claiming another KOM on the descents, then you may need to look elsewhere. But for those who prize outright speed and stability, the Aeris 145 is a big ol’ bruiser that loves monster-trucking its way into, over or through whatever is in front of you. For a UK rough ‘n’ ready full susser, the Aeris 145 is one fast and progressive bruiser. With the Aeris 145, Bird has fully embraced the ‘longer, lower and slacker’ ethos. 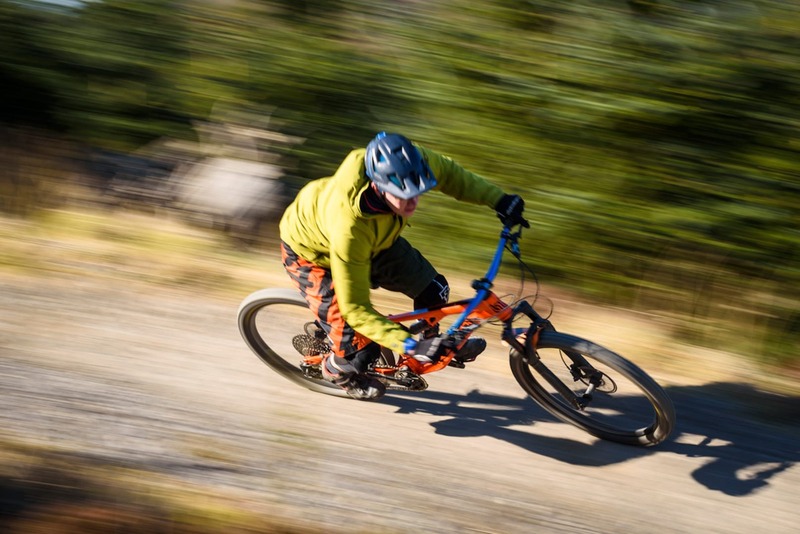 Combined with a tough welded alloy frame and a supple RockShox suspension package, this is an enduro-capable bike that flies down the steepest and most technical of trails, instilling a ton of confidence while doing so. 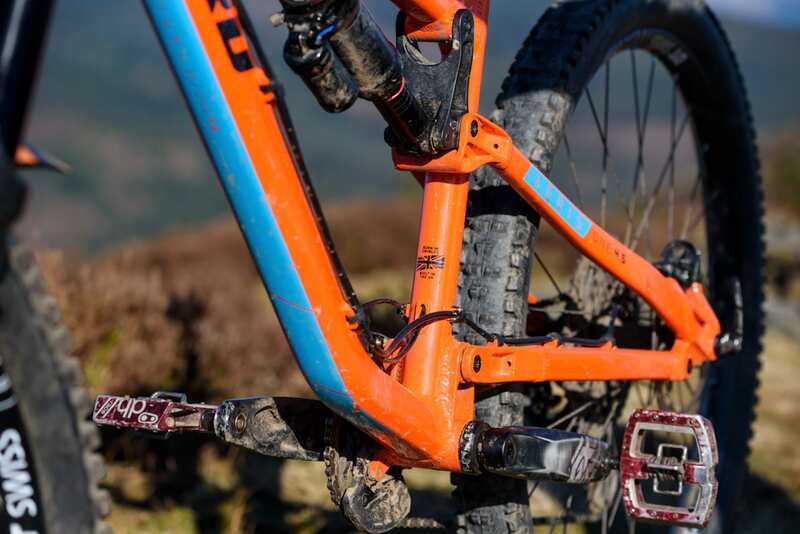 No, it isn’t great for wiggling through tighter trails, but it’ll winch up fire roads without hassle, and for riders who live for the descents, that’s all that matters. Factor in the great pricing and an unrivalled spec list to choose from, and you’ve got one of the most well-thought-out bikes designed for British riding that I’ve had the pleasure of riding in a long time. Enjoyed that one? 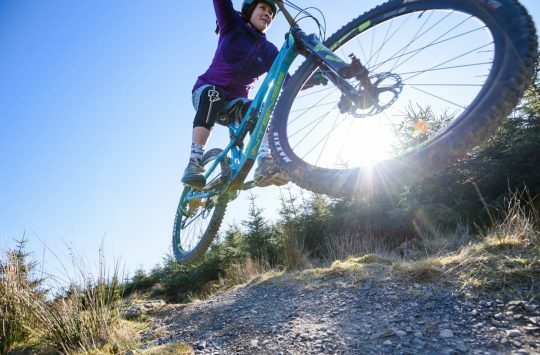 This article was from Issue #118 of Singletrack Magazine, and you can read the full feature and loads of other fantastic stories right here. “Monster truck” is perhaps an appropriate term, but it’s technical climbing ability is incredible. As long as you can keep the cranks turning then it seems to get me up almost any trail I point it at. Descending is equally impressive, but you need to adopt a very aggressive (elbows out, flat back) to have enough weight on the front to avoid understeer.